You’ve just got back from the first and only winery that opened recently. It was incredible seeing and tasting all the different robust reds; they’ve been trying to cater to grape lovers in the area. At the end of the day, you plop in the passenger seat, fold down the mirror for a quick check, and notice some light red stains along the front row of your teeth. After taking a tissue to wipe it, it remains. Your spouse looks over at you struggling. “Bad stains?” he inquires. You don’t answer. Why does this keep happening? There has to be a way to stop this without having to quit drinking wine altogether right? Luckily, teeth whitening may be able to eliminate these persistent statins. Why Does Wine Leave Stains On My Teeth? Trying to rub wine stains off teeth is about as effective as rubbing wine stains out of carpet. Your teeth are not perfectly smooth, even if they feel like they are. Since teeth are full of cracks and imperfections, it makes them very susceptible to highly acidic and pigmented liquids like wine. Other drinks such as coffee, tea, and soda, which are also highly acidic, will cause the enamel in your teeth to break down, making your teeth more porous, or create tiny holes and spaces for liquid to travel into. This is where red wine comes in. Wine has incredibly strong pigments, also known as chromogens, that fill your enamel, leaving this red shade on your teeth. It also carries tannins that help chromogens bind to your teeth even more. How Do I Reduce These Stains? A method many dentists recommend for remedying stains is teeth whitening. 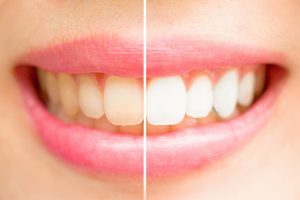 While there are over-the-counter options available, in-office whitening procedures tend to create the most dramatic results due to the strength and concentration of the peroxide used during treatment. Essentially, the dentist takes a whitening gel and spread it on each individual tooth. Most dentists will also use a high-powered light or laser (it’s harmless) to activate the gel and achieve optimal results. This causes the gel it to penetrate your teeth more thoroughly, leaving a whiter smile. Can I Whiten My Teeth Outside of the Dentist Office? If you’re looking for the convenience of an over-the-counter solution with the power of an in-office treatment, ask your dentist about custom take-home trays for teeth whitening. These are designed to let you administer the whitening process on your own time. After scheduling an appointment with your dentist, you’ll receive a bleaching tray specifically designed for your mouth. To begin the process, simply wear the tray for up to an hour each day for about 3-4 days. The tray is also designed to protect your mouth’s soft tissue from the bleach while you wear them so you don’t have to worry about any damage to the rest of your mouth. Don’t let stains ruin your smile. Check out teeth whitening procedures in your area today! Dr. Rick Cofer studied biology at McMurray University before earning his degree at the Baylor School of Dentistry. His practice offers several different treatments and specialties, including Zoom! Teeth Whitening, one of the most effective treatments for teeth whitening to date. To learn more about their procedures and services, you can contact them at (254) 732-0309 or visit their website here.